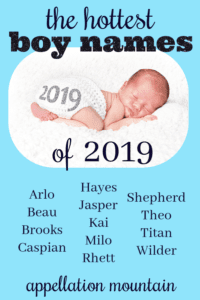 The new year is here, so let’s talk about the hottest boy names 2019! These thirteen choices are the names on everyone’s lips now. They were barely on our radar only a few years ago. But today? We all know a little Milo or Kai. Or maybe we’d consider these names for a son due this year. 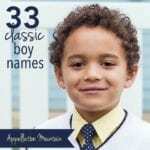 Many of them speak to the bolder way we’re naming boys in this generation: more word names, more elaborate, romantic names, and lots of vowels and softer sounds. From the vintage comebacks to the fresh-and-new, this list has something for every parent. Upbeat and friendly, Arlo is catching on quick. It might be a place name used by Edmund Spenser in The Faerie Queene; a cousin to Charles; or even an invented name that stuck. Arlo Guthrie makes it feel folksy and approachable; Disney-Pixar’s animated apatosaurus turns that up to eleven. It’s a logical successor to current favorite Leo. Beau is handsome – it’s the French translation of the word. It leans Southern gentleman, or maybe cowboy cool, a casual name with a bright sound. 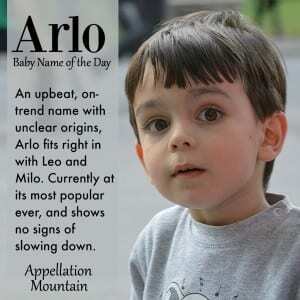 Despite being just one-syllable, this short name packs a lot of style. 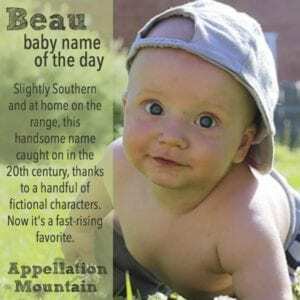 It might sometimes be short for Beauregard or another long name, but Beau really stands on its own. Despite sounding a little bit vintage, Beau has never been as popular as it is today. Read more about Beau here. I’ve called Brooks a preppy hellraiser name – at home in a suit and tie, and every bit as comfortable in a pick-up truck. Possibly at the same time. Brooks started out as a surname for someone who lived near a small stream. It’s Brooks Brothers, the haberdashers, and Garth Brooks, the country music star, that lend the name it’s split personality. I think that’s an appealing set of contrasts for parents, but it helps that Brooks serves as a nature name pick in the key of River, too. I’ve yet to write about Brooks, but check back and I’ll update when I do. An inland sea and a literary prince, Caspian combines two appealing images in one approachable name. 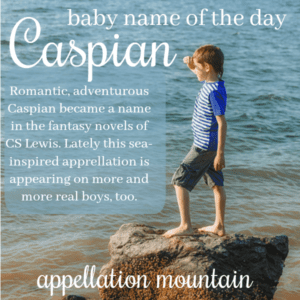 In a generation of boys called Bob and Tom, Caspian would’ve stuck out. But as we’ve fallen for Adrian, Julian, and Gideon, suddenly Caspian sounds like a name that fits in enough. But it retains all of the best qualities of a bold and adventurous name. After all, CS Lewis made his Prince Caspian a hero. Quick: name the nineteenth president of the United States. Rutherford B. Hayes. That puts this name in the company of Carter and Kennedy, and yet it doesn’t quite feel that way, does it? Instead, Hayes owes something to sound-alike word haze, as in a fog – either physical, as in the weather, or mental, as in confusion. Like Brooks, it ends with s. That seems to be another hallmark of a white-hot boy name in 2019. By custom, Caspar or Gaspar is one of the three kings in the Nativity story. 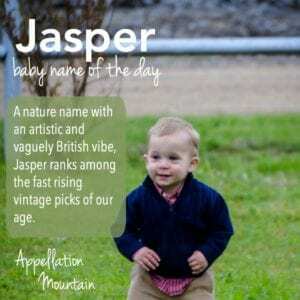 But this name doesn’t feel especially royal, especially not in the most common English form: Jasper. It’s slightly British, maybe because it’s traditionally been slightly more common in the UK than the US. Jasper Johns takes it in an artistic direction. And because it’s also the name of a semi-precious stone, it feels like a nature name and even a color name, too. (Though Jasper can be red or green … and sometimes other colors, too.) Factor in the name’s two-syllable, ends-with-r style, and this ecovintage name is likely to keep on climbing in use. Many short names can claim multiple origins, and Kai is no exception. It’s the ending sound in Malachi; the first syllable of 90s favorite Kyle; it occurs as a nickname for several names in German and Scandinavian languages; and it’s used in Chinese and other languages, too. But the most-cited origin for Kai is the Hawaiian word for sea. That puts it in the company of nature names like River and Rowan. With parents seeking short, culture-spanning names for their children, Kai seems like the kind of pick that might come to define our moment in baby naming. Not so long ago, Milo sounded quirky and out-there, the kind of name embraced by a punk band. (No really. The Descendents released Milo Goes to College in 1978.) But in our age of Miles and Leo, Milo seems like a far more logical choice. 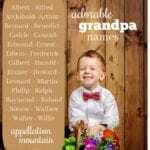 It almost certainly comes from a word meaning gracious or good, another reason it’s likely to appeal to modern parents. True, this name has seen use over nearly a millennia – but it suddenly feels more popular than ever before. Read more about Milo here. I didn’t see this Southern-friend surname coming. Sure, Scarlett – as in Gone With the Wind – has become a top-charting favorite, perhaps encouraging some parents to borrow other names from the book for their children. But probably it’s the success of country music’s Rhett Akins and his son, fellow musician Thomas Rhett. It’s a short name that straddles the traditional and the modern, the kind of name that’s on trend without feeling even a little trendy. Read more about Rhett here. Gentle Shepherd is part-occupational name, and part-spiritual one, too. After all, Christians talk about believers as the flock, and Jesus as their shepherd. That puts Shepherd in the same class as Bodhi and Phoenix, but its surname style also makes it a cousin to Mason and Carter. No surprise, then, that it appears on many parents’ shortlists for a son. Theodore is an evergreen classic, and so there have always been at least a few Theos. Teddys and Teds, too. But lately Theodore belongs with the trending traditionals, re-entering the US Top 100 for the first time in over seventy years. Just Theo is on the upswing, too. Sticking with the nickname only makes the name feel a little more casual and far livelier than thoughtful, buttoned-down Theodore. I’ve yet to write about just Theo, but you can read about Theodore here. An ancient race of gods, the largest moon of Saturn, and a professional football team, Titan is a lot to live up to. We use the word as a synonym for “giant” – a titan of industry. But this is the age of epic boy names, and if we can shortlist Maverick, Legend, and Blaze, then Titan fits right in. It also owes something to our affection for mythological choices, like Orion and Atlas. Together, those two trends make this name white hot. I’ve yet to write about Titan, but check back and I’ll update when I do. 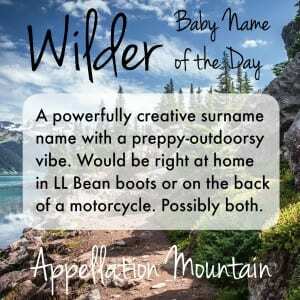 A surname name that bridges the bold and outdoorsy with more conventional surname names, Wilder has gone from seldom-heard to everywhere in just the last few years. it signals adventure and daring, without going as far as names like Rebel or Rogue. That Wil- sound connects it to the most classic of boys’ names, William. And the -er ending has become a go-to sound for boys’ names in this generation. Those are my picks. 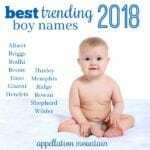 What do you think the hottest boy names 2019 will be? We used Shepherd for our son’s middle name, it’s so handsome. Kai is on our shortlist for a possible brother.